On Wednesday afternoon I attended a meeting of the DCMS Voluntary and Community Sector Forum. With the departure of Alan Davey (to Arts Council England), the Forum has a new chair – Graham Turnock, Director or Programmes and DCMS Third Sector Champion. We heard a presentation on funding for youth culture and the interface between DCMS and the Department for Children, Schools and Families – focusing on the ‘Aiming High’, ‘Myplace’ and ‘Find Your Talent’ programmes. We also heard from Sarah Wilkie of the MLA about the ‘Community Libraries Programme’ and from Steve Mannix of LOCOG about the 2012 Cultural Olympiad. Finally we discussed how to involve VCS organisations in the project board overseeing DCMS involvement in the new Government target PSA21 (communities). On Wednesday I was at the Cabinet Office in London to meet John Knights, Policy Manager- Volunteering at the Office of the Third Sector (OTS) to discuss opportunities for volunteering in relation to the 2012 Cultural Olympiad. We talked about how to ensure voluntary arts groups take advantage of the opportunities presented by the Cultural Olympiad, how the Olympic volunteering programme is being co-ordinated between LOCOG, OTS, DCMS etc, and how to realise the aim of the Games to leave a legacy of increased participation in the arts. We also discussed how OTS might be able to help us to work across other Government Departments to improve support for the voluntary arts and help to unlock the potential of the sector. 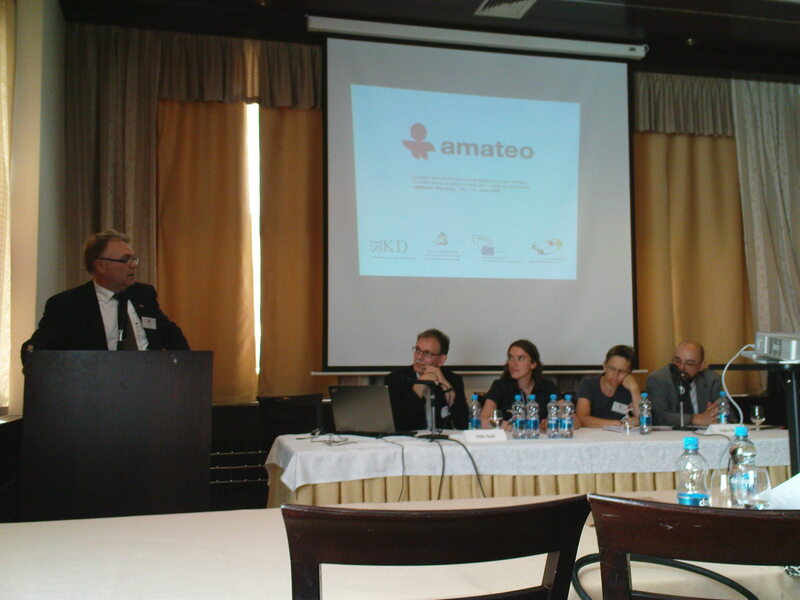 Last weekend I attended the ‘Amateo’ conference in Ljubljana, Slovenia, where we agreed the constitution for a ‘European network for active participation in cultural activities’ and elected the first Board for the new organisation. VAN is the UK representative amongst the seven founding members of ‘Amateo’. In launching the network, its first President, Villy Dall from Denmark, emphasised that the idea was not to duplicate what other European organisations already do: the main idea was to convince politicians and bureaucrats in Brussels and Strasbourg that the application procedures for European funding schemes need to be made more accessible to amateur cultural groups. Amateo will press for an opening up of European funding to the amateur sector and will then develop support to help groups with the application process. Amateo aims to encompass not just the 27 countries of the European Union but all 47 members of the Council of Europe. Villy said that the most essential argument is that the amateur arts need to be recognised as part of the arts across Europe. The conference was small but friendly and constructive. There were around 40 delegates with Robin Osterley from Making Music and me the only representatives from the UK or the Republic of Ireland. As well as the business of the conference we enjoyed a reception hosted by the Mayor of Ljubljana, a fantastic concert in the medieval coastal town of Piran, featuring choral groups from Slovenia, Estonia, Croatia, Hungary, Romania and the Czech Republic, and the 39th annual Slovenian Outdoor Choral Festival in the village of Sendvit. On Wednesday afternoon Reemer and I met the Culture Minister, Margaret Hodge, in her office in the House of Commons. With the debate on 42-day detention going on in the background, we discussed last week’s seminar on ‘Excellence and the Voluntary Arts’ and the forthcoming joint VAE/ACE/DCMS conference, ‘Our Creative Talent’ on 2 July. We focused, in particular, on the need for more explicit recognition by the Government of the voluntary arts sector as an essential part of the wider arts continuum. Margaret Hodge was very keen to ensure that the sector realises it is now highly valued and appreciated by the Government and we agreed a number of ways to get this message across – both on 2 July and beyond. Exciting times ahead – please Gordon, no reshuffles in the next three weeks!! On Wednesday I was at Smithfield Market in London to attend a seminar on ‘The Future for Informal Learning for Adults’, organised by The National Institute of Adult Continuing Education (NIACE). This was an opportunity to build on ‘Shaping the Way Ahead’ – the Department for Innovation, Universities and Skills (DIUS) consultation. A diverse range of around 30 stakeholders from various areas of adult learning (including officials from DIUS) undertook a visioning exercise to answer the question “what should a vibrant and fulfilling adult learning experience be?” I was the only arts representative but I was interested and encouraged that many of the examples of informal adult learning cited by others in my group involved the arts and crafts. We talked a lot about joining up adult learning provision across sectors and disciplines and improved ‘signposting’ to the full range of learning opportunities. This morning I was at The Goring Hotel, Victoria, London, for the final breakfast meeting of the Volunteering Hub Scrutiny Committee. We reflected on the achievements of the Volunteering Hub and the 104 projects we have funded over the past 3 years. We discussed our successes and failures and tried to identify the areas in which the Hub has had the most significant effect. We also heard how the new Volunteering National Support Service is progressing. This will be a much smaller, more focussed partnership programme which will take forward some aspects of the Hub’s work. To ensure continuity, members of the Volunteering Hub Scrutiny Committee have been invited to join a new advisory committee for the National Support Service but I have decided that, after two years, this feels like the right time to bow out and concentrate on other things. I have very much enjoyed the experience of being part of the Scrutiny Committee. I think the model of bringing in external expertise to scrutinise the work of the Volunteering Hub has proved useful and effective. We have certainly been rigorous in our examination of commissioning proposals and project reports – and I think this has been a healthy process for all involved. I’ve gained much insight and confidence myself from being a scrutineer. But I won’t miss getting up at 5 am for the meetings – despite the wonderful breakfasts!